S.A.I.T. and Briercrest men’s and women’s teams went head-to-head for a second time on Saturday, January 27th. Briercrest teams came back with the heart and determination to bring home a win, but lost 64-40 for the women, and 108-84 for the men. The women’s first quarter began with S.A.I.T. scoring the first basket that kicked the game off. S.A.I.T. slowly but steadily gained points as the quarter progressed. As the quarter came to an end, S.A.I.T. players scored multiple shots, putting them in the lead with 21-4. Moriah Williams, for Briercrest, made multiple shots for her team in the first half of the second quarter that furthered Briercrest by six points. S.A.I.T., however, kept their edge and finished the quarter off with 36-19. The third quarter had many attempted but missed shots by both teams in the first six minutes. S.A.I.T. players Melanie Thera and Alicia Tan made baskets that continued their teams steady point climb. Briercrest player, Kai Wyatt, made baskets for her team, but S.A.I.T. walked out of the quarter leading 48-28. S.A.I.T. kept a 20-point lead on Briercrest throughout the fourth quarter. When one team scored, the other quickly scored after and continued the pattern until the end. S.A.I.T. took home the win 64-40 with their player of the game being #3 Alicia Tan, and Briercrest’s player of the game #15 Abby Klassen. The men’s game began similarly with S.A.I.T. player, Julian Apakoh, scoring the first basket. S.A.I.T. made all their free-throws in this quarter, which steadily pushed them ahead. Briercrest player, Kyle Helsloot, attempted and made multiple lay-ups which kept his teaming moving forward. The quarter ended with S.A.I.T. leading 30-19. During the second quarter the Briercrest men began to catch some momentum when players Brennan Gardner and Brian Tolentino made their shots. They were quickly followed-up by S.A.I.T. and soon became close to 20-point down. S.A.I.T. owned the second quarter with 59-38. Briercrest player, Brandon Tolentino, started the third quarter by scoring a three-point jump shot. His brother, Brian, followed his lead and scored a three-point shot less than a minute later. S.A.I.T. held their ground and matched the Briercrest team’s shots, as well as made their lay-ups. 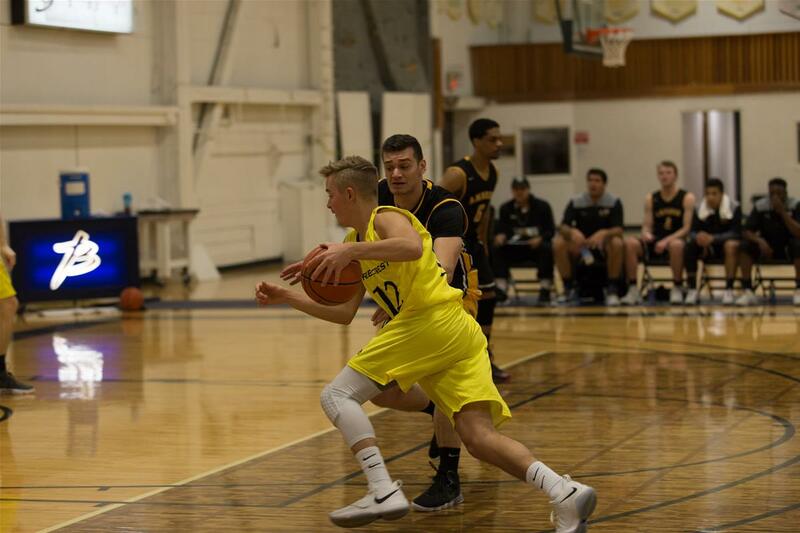 All through the quarter Briercrest was advancing and finished 14 points behind S.A.I.T., ending the quarter at 79-65. The fourth quarter saw a lot of back-and-forth between teams as they fought for the ball. Great shots were made by S.A.I.T., and an impressive dunk shot was made by Briercrest player Kyle Helsloot. The Briercrest team finished off strong by making most of their shots, but S.A.I.T. ended the game with a 108-84 win.